What's included in ChurchSuite Connect? ChurchSuite Connect includes a number of Sunday service member-facing applications that you can run on a device at your weekend service information desk and child registration/check-in point. Connect can be accessed within any browser, or you can use the Android ChurchSuite Connect app available from the PlayStore. Connect is accessible by Users with appropriate module or Connect permissions (see the related support articles at the end of this article) and they will log into Connect using their username and password. The Connect app is currently only available for Android devices. 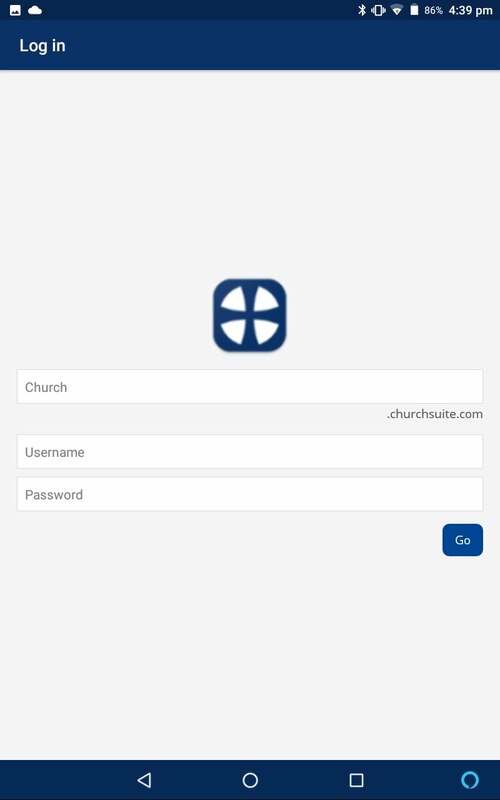 iOS users can still access ChurchSuite Connect via the Safari browser on their iOS device. You may find it helpful to review your device's system settings to ensure the device's autofill/autocomplete functionality has been disabled - many devices have autofill functionality on the device's keyboard app, on the device's default browser and on the device itself. Autofill is designed to store data from forms or web pages when the device is used - often including passwords. The device will then auto-suggest the stored data when a device user next visits a page or form. Clearly this is undesirable behaviour when the device is being used in a public setting where people's personal data privacy is crucial. 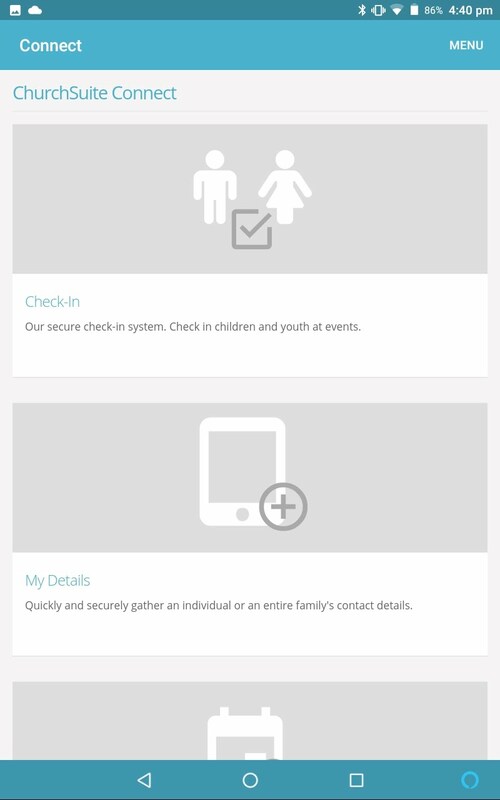 Check-In - our secure check-in system for children and youth group attendance recording. Suitable for your regular and visiting families at any event. My Details - a quick and easy way for individuals and families to connect with your church by securely submitting their contact details and areas of interest. Event List - browse a list of events from your church's public-facing event calendar; they can even sign up. Group List - browse or search your church's small groups, viewing them on a map and as a filterable list; they can even sign up for the one that's right for them. Donate - process one-off and recurring online donations through ChurchSuite's secure online giving system. (Donate is not currently available in the Android Connect app, but is available when accessed via a web browser). 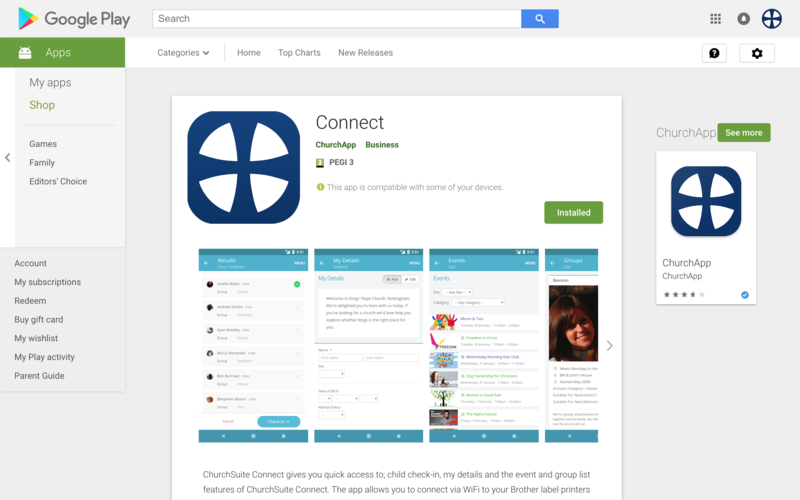 On your Android device, navigate to the Play Store and search for Connect - there are currently two apps on the store, ChurchSuite (the admin-facing and member-facing app), and Connect (which is the app we refer to in this support article. It requires Android 19 Kit Kat 4.4.x or higher). Install the app on your device. Search for and select your church. Enter your username and password. Click 'Go'. If your login details were entered correctly Connect will open and, subject to your user permissions, you'll see a scrollable list of the Connect applications and the app's Menu in the top right corner of the page. From the menu you can switch between different Connect applications quickly and easily. 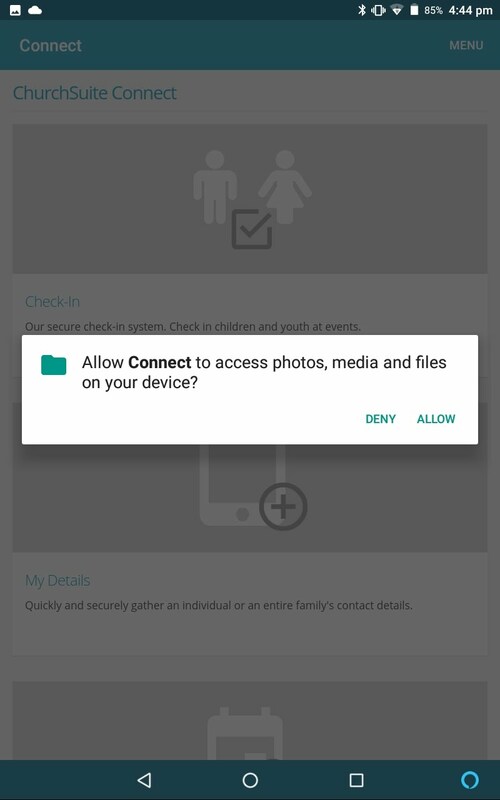 You can also raise a request for assistance with the ChurchSuite Support team, manage your wireless or bluetooth Printer Settings (used for Child Check-in badge printing - see later in this article), adding further Accounts to your app, and Log out. Clicking "Close" will return you to the last page you were on before opening the Menu. Note: It is not necessary to log out when you have finished using the app; simply close the app - the next time you open the app you will already be logged in. However, if you do log out, you'll need to re-enter your church, username and password in order to access Connect. 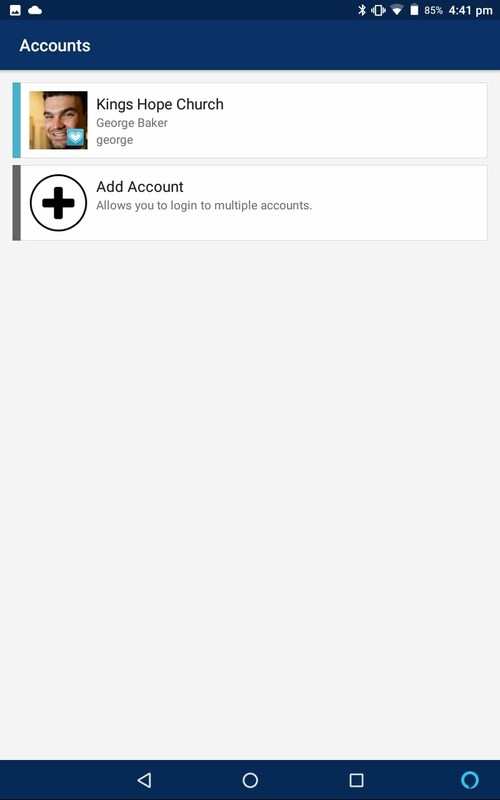 If you are a User for multiple ChurchSuite accounts, you can easily add your other accounts and switch between accounts at any time. You'll set up your printer for wireless printing from a Windows or Mac computer. 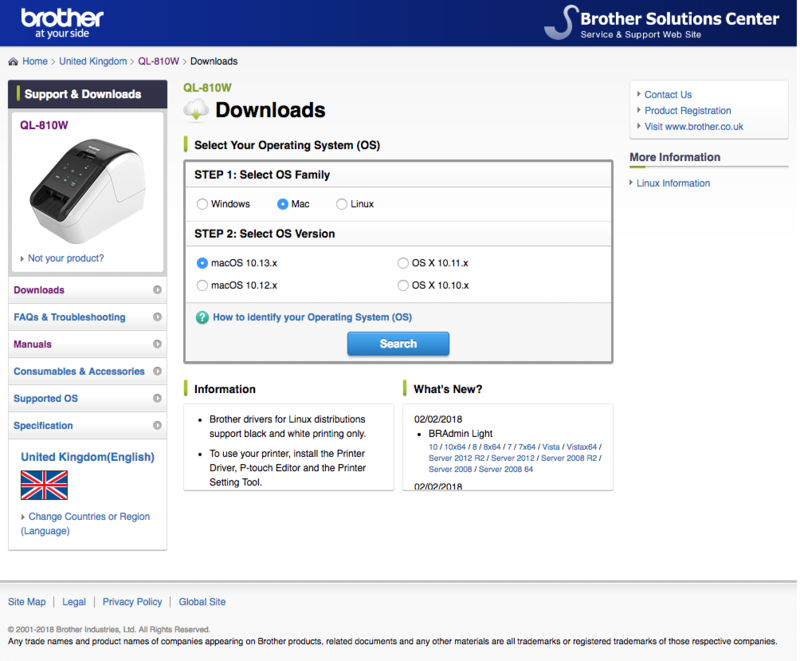 We recommend that you download the latest installation files for your printer model and operating system from Brother's website. Search and locate your particular model. Download the Full Software Package. You can use the Brother Wireless Printer Settings Tool any time you wish to configure your printer for a different wireless network. Note that your device is only capable of storing one wireless network. 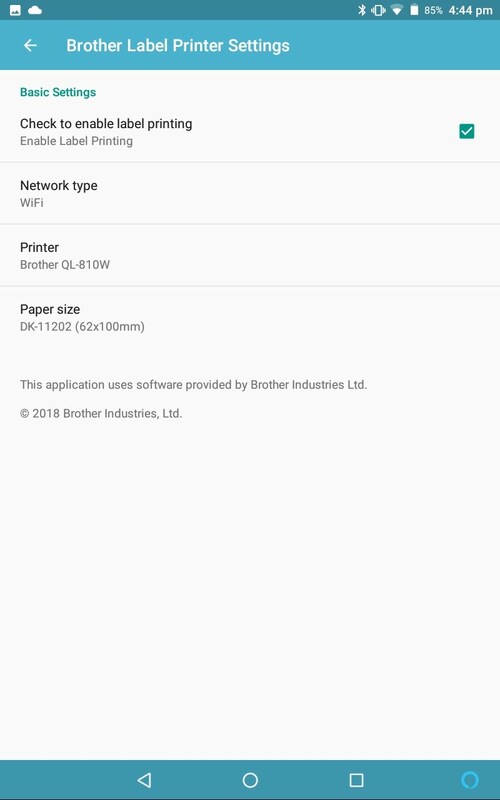 With the Brother printer now connected to your wireless network, you can now continue into the next section in this article to configure the Connect app and connect to your Brother printer. 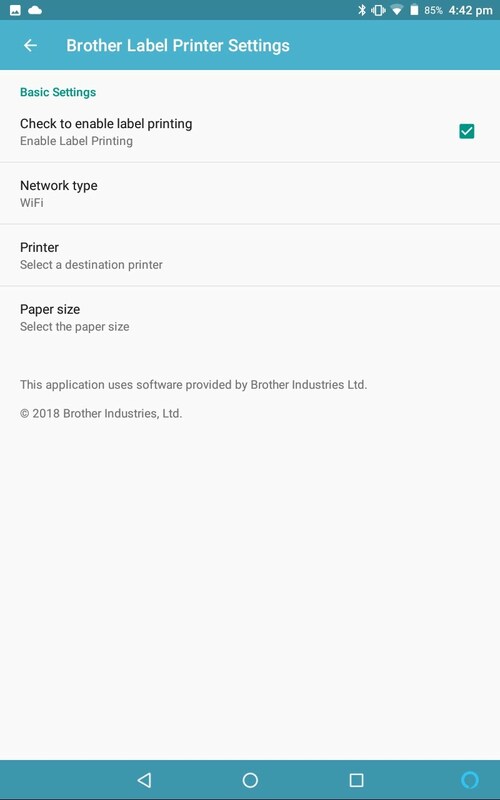 Having first set up and configured your Brother wireless printer (see previous section), it's now easy to configure your Connect app to print over WiFi or over Bluetooth. From the Connect app Menu, click Printer Settings. You must click the checkbox to "enable label printing". Note that if you have no label printing requirements, you can of course still use the Child Check-In system without needing to connect to a printer. In this way you can simply check children in and out without any child, parent, room or team badges being printed. Next, click "Network type" and select between WiFi or Bluetooth. Click "Printer". 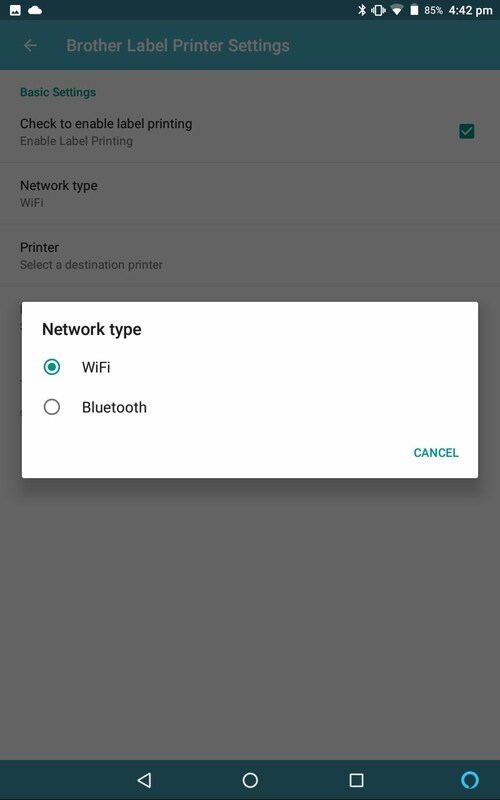 The Connect app will scan for available, correctly configured printers on your WiFi network or within Bluetooth range. Choose your printer from the list. Next, select "Paper size" and choose the appropriate label stock from the list. Note that if there is a mismatch between your selected and installed label stock, you will receive an error message when you print. 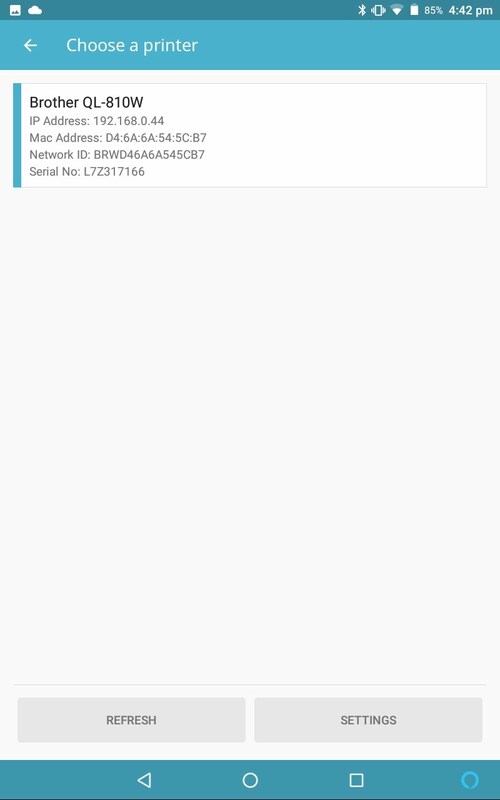 The "Paper size" options in the Connect app (see above) refer to the Brother DK label stocks that are readily available from a variety of online retailers. DK-22XXX are continuous label rolls and DK-11XXX are die cut individual labels on a roll. Both label types are 62mm in width and are compatible with all our currently supported Brother printers. Therefore, looking at the label dimensions in the above screenshot, you can see that the printed label for each type will either be a small 29mm height label, or a large 100mm width label (printed rotated through 90º). Whether you choose small or large labels in the Connect app, it's important that the Children module options in ChurchSuite for Connect are set to the matching small or large ticket size. Essentially, the module settings determine the size of the PDF label that Connect will render, while your app or browser settings will determine the paper size that PDF will be printed on to. 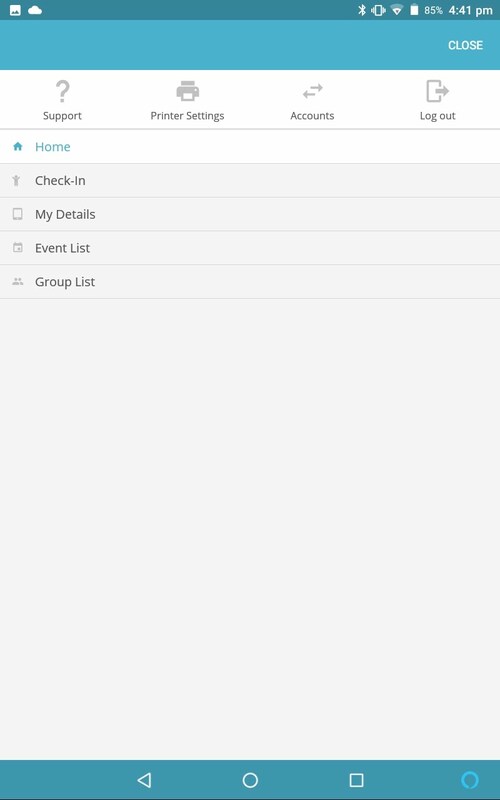 To check your settings, head into your Children module options, navigate to the Connect tab and set the "Check-in Ticket Size" to Brother Large or Brother Small to match the paper size you are using in the Connect app. 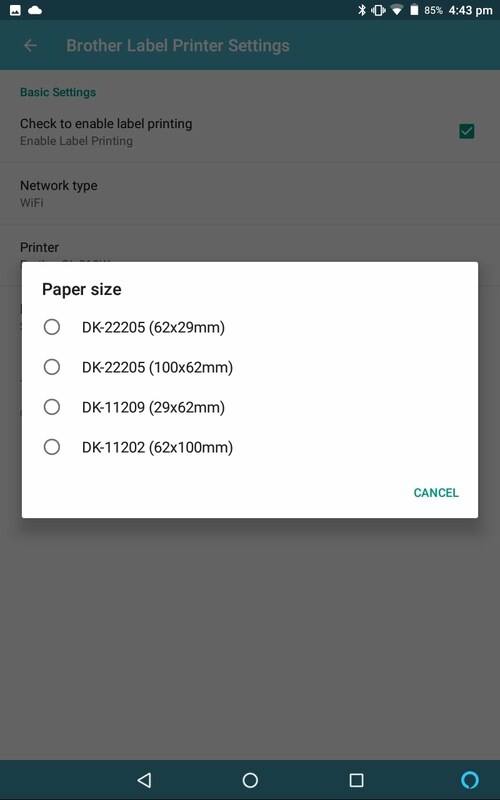 If you are running multiple check-in devices (wireless or wired), they will each need to have the same "Paper size" settings. Having completed all the printer settings you can click the "Back" arrow at the top left of the page to return to the Menu. You can return to the Printer Settings page at any time, perhaps to select a different printer or paper size at any time. When you configure the printer settings for the first time, you will be prompted to "Allow Connect to access photos, media and files on your device". In order to use Connect you will need to "Allow" the app access.